Police abusing the other emergency services to facilitate the fracking industry – disgraceful waste of taxpayers money and putting other people at risk by tying up an essential piece of emergency equipment. The Fire Brigades Union has accused North Yorkshire Police of making a “nuisance call” when it requested fire service help at an anti-fracking protest at Kirby Misperton. “I think the police should not have used us in that manner. I think it was a misuse of fire service resources. It was a false alarm. Whilst this has been covered by the BBC, they gave very little mention of the road traffic incident instead focusing on demonising the protectors. Excellent coverage as always from Ruth Hayhurst, Drill or Drop . Half an hour ago a second supplier pulled out of a contract with Cuadrilla for its fracking site at Preston New Road near Blackpool. 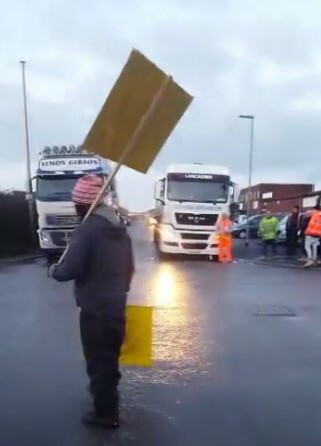 Opponents of Cuadrilla’s activities blockaded Moore’s Readymix Concrete in St Annes this morning.